It has been four years since I was diagnosed with a dairy intolerance. The diagnosis itself was a great relief (I spent the first 22 years of my life with miserable abdominal health issues due to an unknown cause), but it was also a real slap to the face. My diet was based around dairy, and as I had been working as a professional baker at the time, it was my livelihood. Unlike most people with dairy issues, I could not handle dairy in any amount or in any form. I was devastated. It took me a long time to adjust to my new, unwanted diet. I went through the stages of grief: denial, when I refused to eat dairy-free foods; anger, when I realized I would have to change my approach to food; bargaining, when I convinced myself dairy would be worth the pain (it never was); depression, when I would stand outside the bakery counter staring at all the food I had given up; and lastly, acceptance. It took me a couple years to fully accept and embrace the dairy-free diet (and even longer to find delicious dairy-free counterparts to my favorite dairy-filled foods). I am aware there is a certain irony to baking without baking's greatest gifts—butter, cheese, milk, and heavy cream. In fact, I couldn't even steal a lick from the spatula when I spent days preparing cupcakes for my sister's wedding. Even though I write the recipes on Pastry Affair to include dairy ingredients, you can rest assured that the recipes are created dairy-free in my own kitchen. The first dairy-free alternative I fell in love with was almond milk. The milk is creamy with a subtle almond flavor, which works beautifully in baking and morning cereal. When Wolf Gourmet asked me to test their High Performance Blender, I knew that homemade almond milk would be my first challenge. I haven't made almond milk with my current low-end blender because it has a difficult time breaking down small foods. For example, the greens are in larger pieces than I prefer in this green smoothie, and there is a visible level of grain in this chocolate hazelnut spread that could be eliminated with a high powered blender. Essentially, almond milk is made by blending almonds with filtered water. The almonds are first soaked overnight to soften. Ideally, to create the creamiest milk, you need to extract as much as possible from the almonds by breaking them down into very fine pieces. When I set the Wolf Gourmet blender to task, the leftover almond pulp was finer than almond meal. I have used other high-end blenders, but I prefer this one because it not only includes presets for the most common blended foods (like smoothies and purées), but it also has a timer that helps you keep track of time elapsed. While the almond milk can be left unsweetened, I added vanilla extract and maple syrup to give it a subtle flavor and sweetness. Edit: Giveaway is closed and the winner has been chosen. 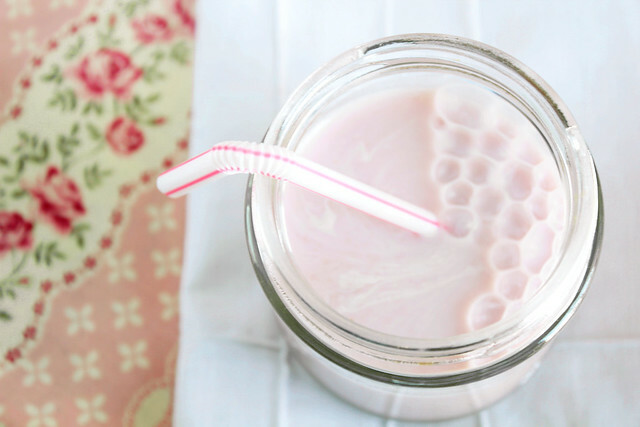 Homemade Almond Milk is incredibly easy to make at home and can be customized to your tastes. This version uses vanilla extract to provide a light flavor and maple syrup for a subtle sweetness. If you have a sweeter palate, feel free to add more maple syrup, or even honey, to taste. This almond milk has a similar thickness to 2% milk. For almond milk with a thinner consistency, add more water when blending; likewise, for a thicker almond milk, reduce the amount of water. The almond milk can be used in the same manner as dairy milk—for cooking, baking, and drinking. Place almonds in a container and cover with 3 cups filtered water. Seal container and allow to soak overnight, for 8 hours up to 2 days. Strain almonds and rinse with fresh water (the almonds release phytic acid while soaking, which prevents the body from absorbing nutrients; rinsing the almonds removes this acid). Place almonds and remaining 5 cups filtered water in a blender. Add maple syrup and vanilla extract. Blend on high for 2-3 minutes. Using a nut bag, layered cheesecloth, or fine mesh strainer, strain the almond milk to remove the pulp. If using the fine mesh strainer, run the milk through several times to eliminate pulp. The leftover pulp can be used in smoothies, muffins, or breads or it can be dehydrated and used in the same manner as almond flour. Keep refrigerated. Almond milk stays fresh for 5 to 7 days. Disclosure: A complimentary High Performance Blender was provided for review by Wolf Gourmet. As always, all thoughts and opinions are my own. I've always had a deep love for milk. As early as I can remember, I viewed milk as a special treat. It didn't matter that it was always in the fridge or that I drank it at every single meal—it was still special. It was almost like getting dessert before the end of dinner. When I was in my teens, I could go through a quarter of a gallon in a day. Milk was my water. I was, for all intents and purposes, a milk addict. 2% was my drug of choice. It wasn't until I discovered these dreadful little things called calories did I realize that maybe drinking so much milk wasn't doing myself any favors. About the same time, I realized I could eat more cookies if I drank less milk; a trade off I could definitely consent to. My sister was just the opposite. You couldn't get her to drink a glass of milk even if you threatened her with no dessert. We told her she wouldn't grow up big and strong. We told her she would never grow tall. We told her these things and she still refused; she meant business. My sister was so drastic that she would refuse to have milk with her cookies. Believe it or not, she would dunk her Oreos in water instead (which she still will do, much to the chagrin of those watching). Even with so much milk in the house, flavored milks weren't a part of my childhood. Occasionally my mother would buy chocolate milk to serve for dessert, but those occasions were few and far between. It wasn't until I was older and buying my own groceries that I noticed them in the stores. I was always tempted to try them, but with so much sugar, preservatives, and the lack of real fruit, I couldn't bring myself to do it. 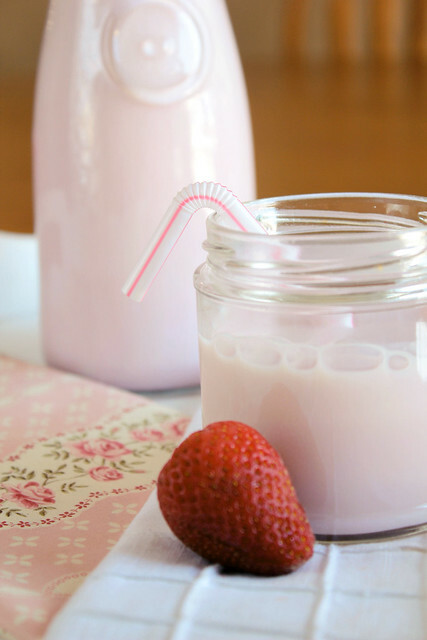 It wasn't until I saw a post from The Kitchn on making your own strawberry milk did it occur to me that I could make my own. The results were definitely worth sharing with you. 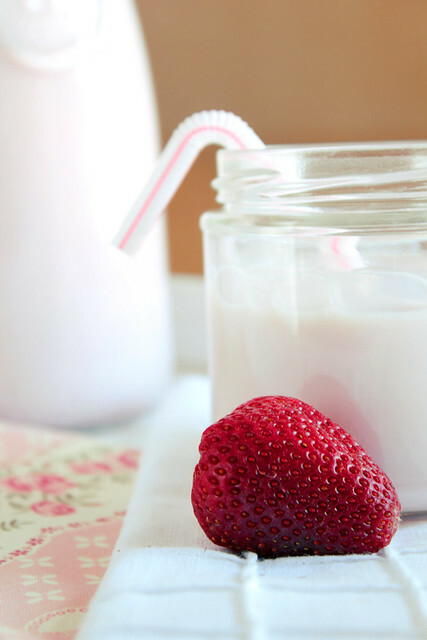 This strawberry milk is subtly refreshing. The milk is lightly sweetened (there is just a hint of sugar), but you could add more sugar to adjust to your own tastes. The strawberries stand out in this drink, making it a perfect substitute for the store bought version. Drink this chilled for breakfast or dessert. My sister loved these Brown Butter Rice Krispie Bars so much I made them twice in one weekend. Each time the batch didn't last more than 18 hours sitting on my kitchen counter. Either no one in my family has any self-restraint or these actually are addictive, delicious, little bars. I'm going to go with the latter. After so much success with those browned butter bars, I thought I would try my hand with something along a similar vein—cereal and milk bars. I've seen this idea in the stores but I can't quite bring myself to buy them (mainly because they are stuffed with preservatives and still taste stale). I figured making these myself couldn't be too hard (after all, they are very similar to rice krispie bars), so I decided to give them a try. 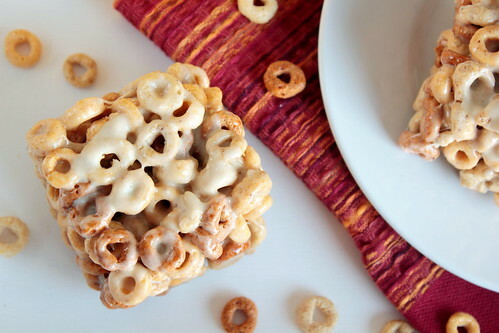 I chose to use multi-grain cheerios because these are a favorite in my household. I figured I'm adding enough sugar with the marshmallows so using a healthier cereal would keep these bars from popping my shirt buttons. Though, I imagine a brightly colored cereal would make these look irresistible. 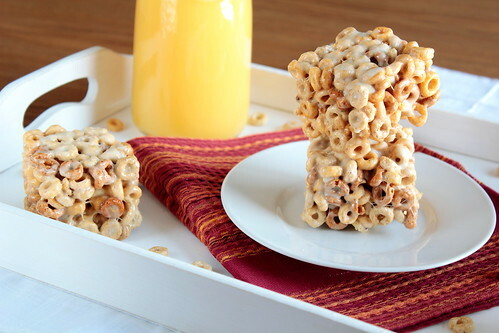 This recipe is so diverse because you can honestly use any cereal of your choosing. The bars have a chewy and crunchy texture. The browned butter gives them a subtle nutty flavor with a greater depth of flavor. 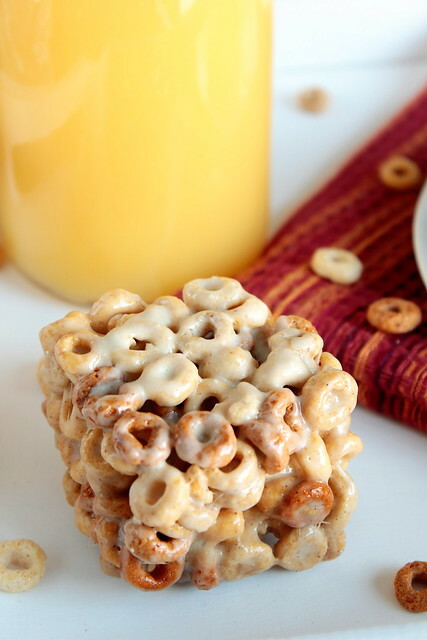 The milk glaze gives them more of a "bowl full of cereal" quality to them. If you like rice krispie bars, these are for you.